On Friday 20th January, 27 of our Year 3 and 4’s took part in Bikeability Level 1 Training here at our school. We had two instructors from ‘Outspoken’ to run the course, and all our children thoroughly enjoyed it. 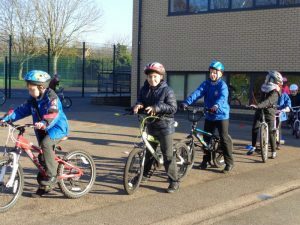 During the two hour course the children learnt different skills and manoeuvres to help their cycling ability and safety. These included controlling the bike with one hand. including looking around without loss of control and being able to stop quickly. Hopefully the children will put these skills into practice, and this will encourage them and others to regularly cycle to school.